Cocktail Table model of original Pong. 28" high, 29 3/4" diameter of top. Received with top disconnected. Monitor lights up but does not display game. Base worn, some scuffing and minor tearing of upholstery. Inset glass in top over monitor has screened yellow block with gameplay instructions, some scaling off yellow but gameplay instructions intact. Knobs are not original. They were replaced by the donor. Coin-op mechanism disconnected and in poor condition. Game brought back to playing condition by Al Alcorn, February 2014. Cause of monitor failure was one capacitor. "When I received the machine it only displayed a blank raster and no sign of a game. We verified that the Pong PCB was producing video so the problem was in the monitor. The monitor is a 15” monochrome Motorola chassis also used in a Wang work processing terminal. I was able to find a service manual which proved valuable in trouble shooting. I tried to minimize any modification or damage to the unit so I took the time to positively determine the fault before replacing a part. I discovered a shorted 470 µF electrolytic in the video bias circuit. Once that was replaced the monitor worked. I then adjusted and aligned the monitor. After I ran and reassembled the unit and ran it for a while and then I discovered an instability in the display that responded to vibration. I put the guts back on the bench and tried to troubleshoot but couldn’t really pinpoint anything but the display would intermittently flicker. I guessed that the connectors on the display printed circuit board might be dirty so I re-seated the board and that appears to have solved the problem. I replaced the locks with new ones, both keyed the same. Fortunately the knobs were not glued on so I was able to easily get them off. The pots I found on the unit were low quality, cheap units. Because the knob is so large the player can put a lot of torque on the pot at the stops of rotation which the cheap pots can’t take. It was surprisingly difficult to find suitable replacements. All I could find at Haltech were Allen Bradley pots of the same era and I don’t trust them as they die of old age. I finally found a pair of Clairostat Type J pots on ebay. They have a much stronger bushing and can handle more aggressive use. If it were my machine I would replace the knobs with something more like the diameter ones on the arcade Pong. I also think the pots may be wired backwards too but I left it the way I found it." "It appears to be location ready with a (non-functioning) coin mechanism and a cash box but there is no apparent way to lock the top down and the machine is wired for free play even though it has a coin counter. If it was on location it wasn’t there a long time. The machine shows little wear other than the pots. The logic board is a genuine Atari Rev E Pong board and if the machine were made as an unauthorized product there were logic boards available that would have been easier to get than a real Atari board. All the auxiliary components are the same ones Atari used like the line filter, coin counter, interlock switch etc. but it has no label of any kind on it that would indicate who made it. The logic board was made in early 1973 based on the date codes on the ICs. None later than mid ’73. The unit is very heavy and made out of plywood not particle board like we used in all production cabinets. Roger Hector and Steve Bristow think it may have been a prototype constructed at Atari but in the model shop not the manufacturing floor. I am inclined to agree but can’t be positive. If it was made by a party other than Atari it could have been from a “kit” that we sold to international partners. The only possible manufacturer I could think of is a guy in Southern California that did carnivals and we had some kind of relationship with him until it went sour. But I think this happened in ’74 later than when that machine was built." Curt Vendel claims to have one that is identical to ours. 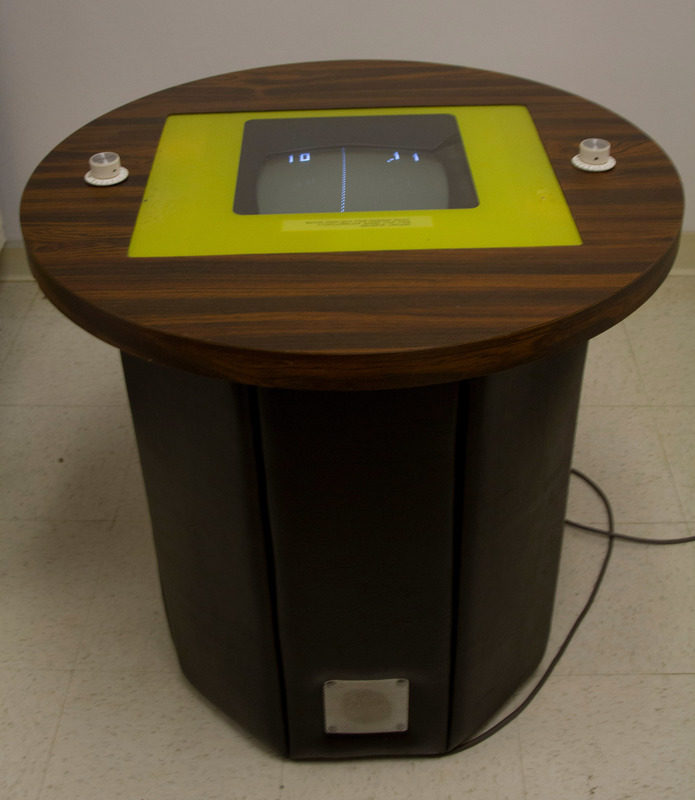 Atari, “Atari Pong Cocktail Table Arcade Game,” Digital Game Museum Collection, accessed April 24, 2019, https://www.digitalgamemuseum.org/collection/items/show/936.